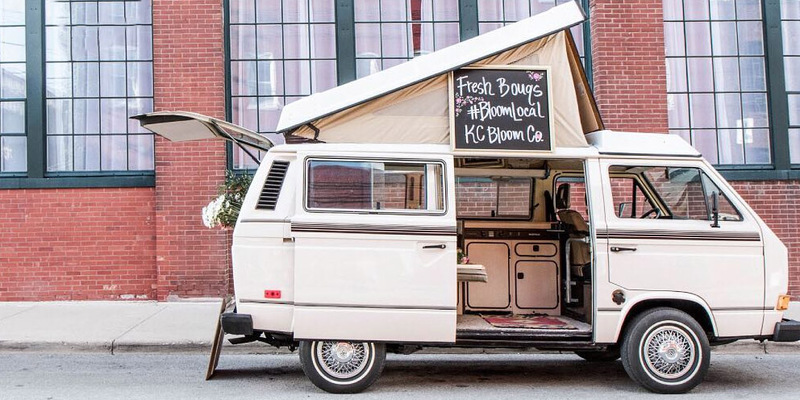 Image via KC Bloom Co.
Coffee campers, flower vans and fashion trucks have taken over the shopping and dining scene in Kansas City, transforming the familiar food truck formula into a fresh concept. 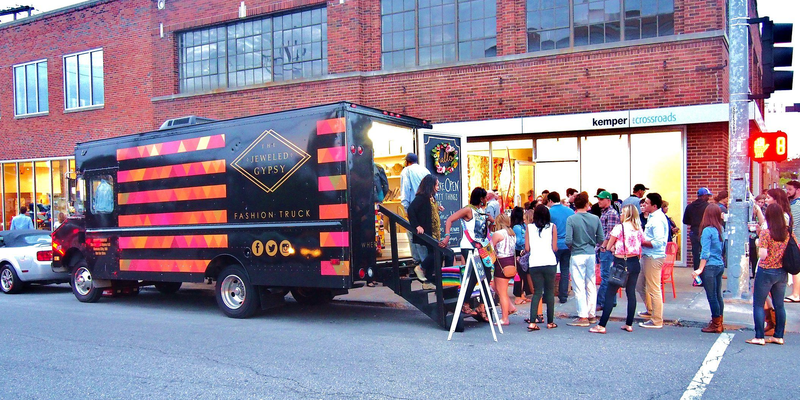 These modern trucks are mobile wonderlands that bring apparel, dessert, coffee and flowers right where you want them most. 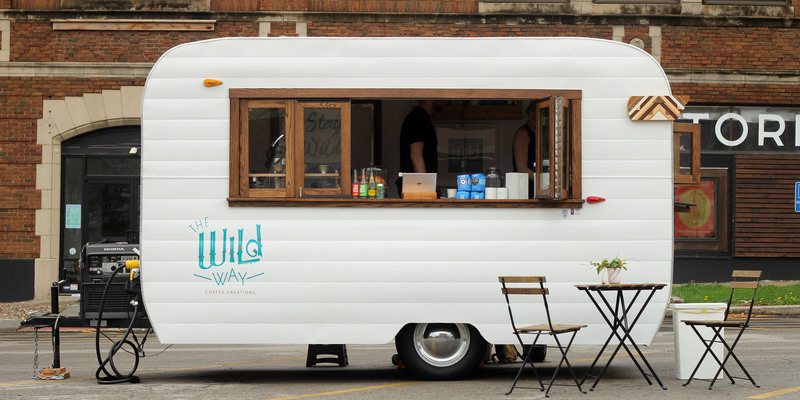 The Wild Way is one of the first mobile coffee shops to hit the road in Kansas City. Created by husband and wife team Jon and Christine Clutton, the café on wheels aspires to take the road less travelled, which clearly shows through their adventurous and unique business. Selling coffee, tea and seasonal drinks, The Wild Way serves a one-of-a-kind experience in their charming camper. Find it around the city and at its winter warehouse in the East Crossroads. 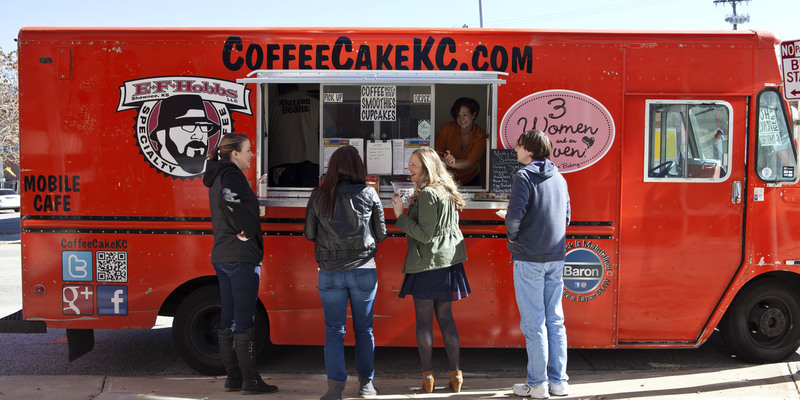 CoffeeCakeKC is another popular coffee and dessert shop on wheels. The business serves mouthwatering desserts, locally roasted coffee from Mother Earth Coffee and a full espresso bar with tea, frappes and fruit smoothies. Get your caffeination throughout the metro by reviewing the business’s location calendar. 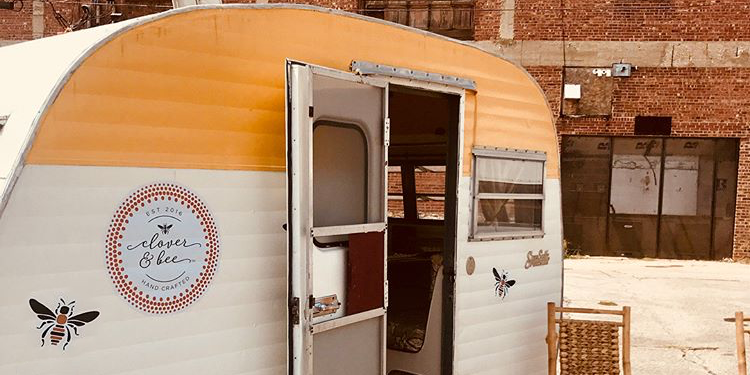 A fixture of big-time local events such as First Fridays in the Crossroads Arts District, The Jeweled Gypsy is the brainchild of mother-in-law and daughter-in-law duo Janey Schmutzler and Kristi Sargent. The team had one goal in mind when the business was founded: offer upcoming apparel and accessory trends to Kansas City. The Jeweled Gypsy does just that, specializing in unique accessories like trendy straw bags and exclusive jewelry while also working with local KC companies. Find the Jeweled Gypsy Truck in its revamped 1987 Chevy step van at local events and festivals in the KC area. Madi Apparel specializes in intimates and lounge wear, with sales supporting domestic violence shelters, sustainability and U.S. production. 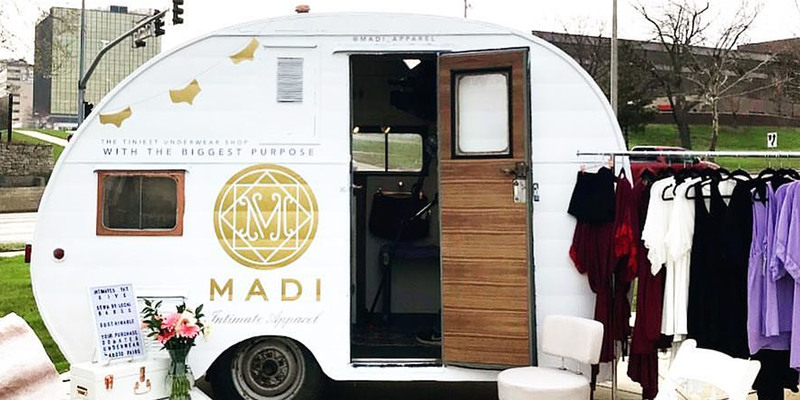 Following the trend of mobile boutiques, Madi Mobile is a sleek, minimalist camper that serves as an extension to its flagship store in KC’s Westside neighborhood. Expect to see the shop at events and festivals in the Kansas City area and review the calendar for full details. 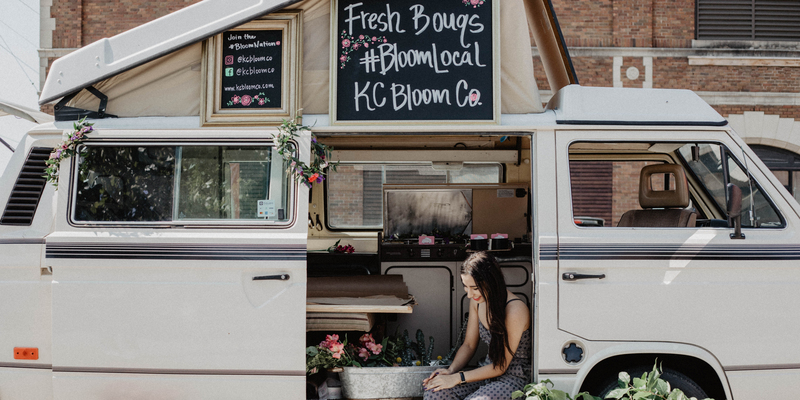 The first mobile flower van in Kansas City, KC Bloom Co.’s goal is to make blooms more accessible and create authentic experiences throughout the city. Kate Bryan has always loved French crêpes. 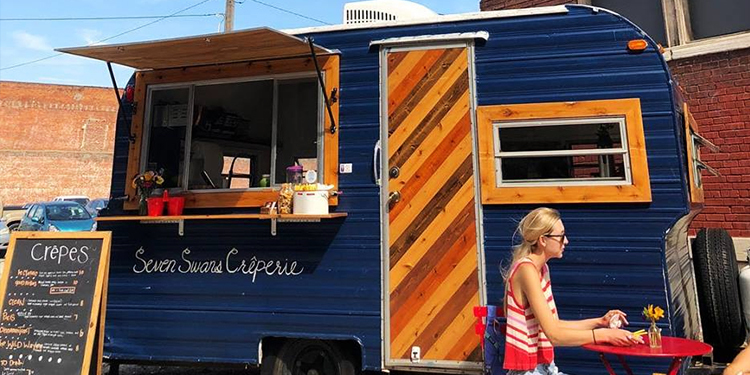 In 2017, she created Seven Swans Crêperie, a food truck filled with internationally inspired and traditional French crêpes. Since it first hit the road, Bryan has become a mainstay at pop-ups, festivals and weddings, offering up an internationally delightful crêpe experience. Clover & Bee is an indie beauty skincare company founded by an established aesthetician Christy Nichols. With a passion for gentle, organic and eco-friendly ingredients, Nichols uses the honey made in her own backyard hive to create Clover & Bee Body Polish. Find their organic body polish throughout the KC area by reviewing the business’s Facebook page.